Project Convivencia is reaching its 10th anniversary. It considers itself the inheritor of the Center for Civic Training known as the Centro de Formación Cívica and of Vitral magazine (1993-2007) belonging to the Diocese of Pinar del Río, since most of its founders participated in both of these. It makes for 25 continuous years. 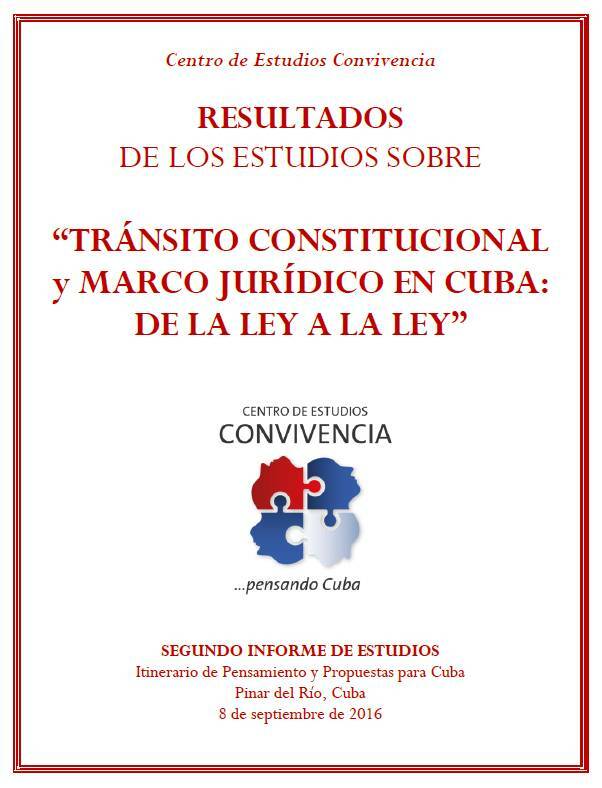 This is not a small matter for Cuba, given that they are all projects of an independent civil society. Some friends have asked us: What is the secret to this quarter of a century of perseverance? We have replied that there is no secret. We believe that it has been due to what we are, what we do, and how we do it, and due to what we want for Cuba. To be able to persevere it is necessary, first and above all, to be aware of what we are in order to stay faithful to our own identity, one we have freely chosen. What is most important is what we are, not so much what we do. Without an identity no project can endure. Convivencia is an independent, inclusive and dialogue-seeking socio-cultural project. 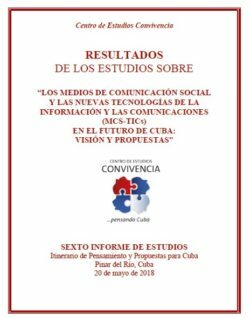 We are an educational and communication project, promoter of small initiatives in the civil society and a generator of thoughts and proposals for Cuba. At the same time we are non-profit, non-partisan and non-denominational. The founders and members of Convivencia are Cubans who are aware of our vocation of service to Cuba, as well as about the responsibility and commitment that this entails. We believe in the primacy of the individual over politics, economics, religion, structures and any and all institutions, which ought to be placed at his/her service and not the other way around. We believe in the strength that lies in the seed, at the time of planting and of harvesting. We work at being weavers of coexistence, we are bridge builders among people with differences, and we are facilitators of dialogs and meetings among Cubans, with two lungs: one in the island and the other in the Diaspora. We opt to remain in Cuba because it is more important to be than to do, to be than to escape, although we respect and defend the right to freely emigrate. We believe that there can be no citizens if we are not people, that there can be no democracy without democrats, that there can be no civil society without weavers of coexistence, that is, that “There is no Fatherland without virtue,” as Father Félix Varela taught us. Because of what we are, Convivencia has endured. In order to persevere and be true to what we are, it is also necessary to freely and responsibly decide on what we do and on how we do it. We believe that the ends do not justify the means, and that ethical coherence between what we think, what we say and what we do, in addition to “how” we do it, is the best way to show what we are: “By their works you will know them” (Matthew 7:16). One could even change names, or projects or means while still keeping on with the same vision and the same goals. This happened to us at Centro Cívico, Vitral (1993-2007) and at the Center for Studies (Centro de Estudios) and Convivenciamagazine (2007-2017). Both were begun with educational courses and services in ethics and civics. 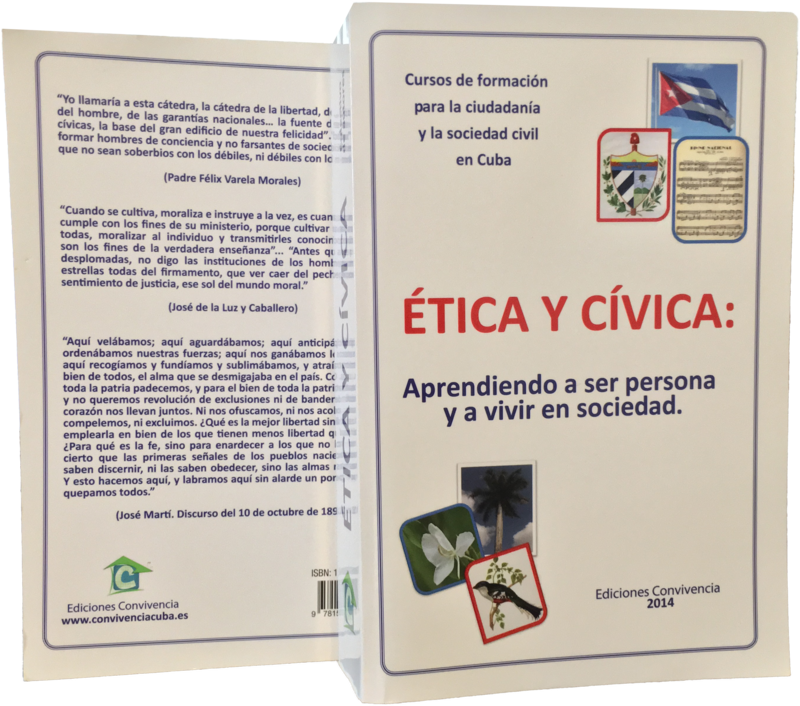 The textbook Ética y Cívica (Ethics and Civics) was edited and published by the staffs of Centro Cívico and Convivencia, and is available atwww.centroconvivencia.org. Later these two projects would turn into two journals (www.vitral.org and www.centroconvivencia.org). Additionally, each of these initiatives, each having its own nuances, have tried to offer a serious, responsible and profound contribution to thoughts and proposals regarding the future of Cuba. This is what we have done and what we do. There are no ulterior motives or thoughts of evasion. And how we do it is also clear: in an ethical, transparent and peaceful way. We elect to engage in dialog and negotiation for conflict resolution. It is not that caricature of the “appeasing dialog”, unanimous and mimetic, but rather a responsible dialog, one that is true to what we are and what we hope for, neither pusillanimous nor violent, a dialog that becomes a lifestyle, an attitude and not only a method. We prefer consensus building to force unanimity, to follow the law and to ethically comply with agreements and words of honor. We do not accept violent confrontation. That is why we reject any form of violence from mental or psychological all the way to verbal or physical violence. We reject disqualifications and personal attacks. We debate and disagree on ideas and reasons, but respecting the private lives and morality of each human being. We believe that he who attacks, loses. He loses balance, personal ethics and civic posture. He who debates and makes proposals, wins. All of society wins: peace, citizen coexistence and social progress. Because of what we do and how we do it, Convivencia has endured. Another guarantee of the perseverance and continuity of a project is to be clear about what we want, the vision that we seek, the future that we desire to build with the rest of society. Without bright lights and a long view there is no coherent sense, orientation, destination or roadmap. Without a clear horizon or lacking a trusted compass, there are not sure steps or secure destinations. We can summarize it as: a clear conscience, a long view and sure steps. 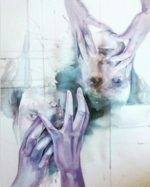 To heal the anthropological damage produced by totalitarianism, we propose the reconstruction of the human personof Cubans through a liberating, participative, personalizing, and socializing education to help families and to make schools that produce ethical, civic, free and responsible people. 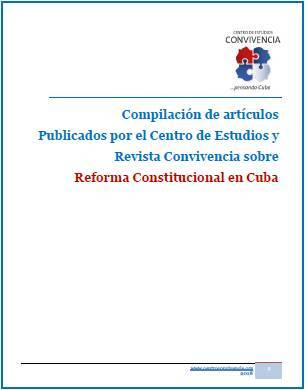 To heal the alienation, social disintegration and civic anomy, we propose the reconstruction of the Cuban civil societyby means of the same style of pedagogical schooling, the recuperation of the family as the first nucleus for personalization and socialization, the promotion of weavers of coexistence or civic activists, which, as bridge builders, promoters of personal and community initiatives, will develop civic friendship and social, economic and political projects which will rehabilitate the frayed social fabric. To heal a closed and exclusive society, we propose to favor democratic styles and practices in a climate of freedom and human rights for all, within an inclusive, participatory and democratic system, coherent with our identity, idiosyncrasy and Western culture, from small groups and initiatives to the family, civic society, churches, fraternal associations, trade unions and professionals, exercising governability and governance in a type of society, economic model and political system in which possessions, knowledge and power are placed at the service of society. 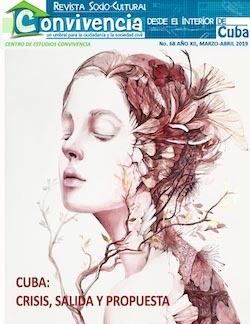 To heal the banalization and manipulation of our culture we propose to promote, renew, educate and live according to the spirit of Cuban culture: of humanistic, mixed-race, pluralistic, open, welcoming, and Christian-matrix character, to be faithful to our roots, to strengthen our national identity, to renew what we are, responding to the new challenges of these times. To not fear or close ourselves to global integration without losing the Cuban soul. We understand culture as the foundation, the soul and the fecundity of the nation, as the root of our ethnicity which is born and developed in the projects of Varela and Martí; that is to say the ethosof what is Cuban, of our schools of thought, of our educational projects, of our artistic-literary creations, the experiences, expressions and religious references, the ways of coexisting, the fabric of our civil society, its own dynamics and methods of relating. We consider that culture, in its deeper and more encompassing sense, is of transcendental impact on the lifestyles and ways of organization of the Cuban society in the present and in the future. This national character and vital breath informs in a cross-sectional way, identifies in depth, and impregnates in diversity, all other sectors of national life: family, education, religion, economy, politics, and ways of organization of civil society, international relations, among others. For this that we want, Convivencia has endured. In celebrating the first ten years of Convivencia, we have not wished to disguise or discard the unspeakable agonies and systematic harassment that we have encountered on our way. We believe that these strengthen our souls, reinforce our virtue and confirm the goodness of our endeavor. We want to concentrate and focus on the announcement of what we are and intend to be, on what we do and on how we wish to do it, and on the announcement of the visions, styles and societal projects we are thinking about, proposing and working on so that Cuba will be a free, democratic, prosperous and happy nation. This mysticism, sense and engine for our work are what have sustained our permanence in Cuba, our perseverance in the work, our fidelity to Cuba and to her Church. It is, in the end, the deep reason for our hope.